Have a good Thanksgiving, folks. There's a lot of crap going on in the world, even in our glorious U.S. of A., a lot to protest, complain over, and even sympathize for. But there's also good things, quite a lot more than we give credit to on a daily basis. Remember those things, and those who provided them. At the absolute minimum, give thanks for those things. However few they are. 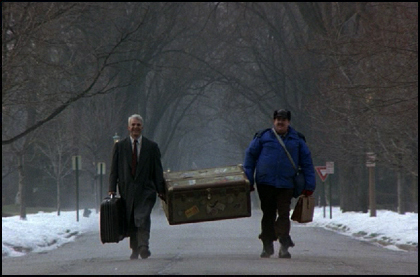 And go watch Planes, Trains and Automobiles, the ultimate Thanksgiving movie. If you have seen it already, go see it again (better yet, buy a copy). If you haven't ever seen it, what's wrong with you? A series of fortuitous† events recently got me thinking about old computer RPG games. Now, I'm a longtime gamer, but I actually didn't grow up with any console games except Atari, back in the mid-80s. I never owned Nintendo, or Sega Genesis, and certainly not a Play Station or X-Box. At best, I had friends who did, and would sometimes get to watch or play their games. 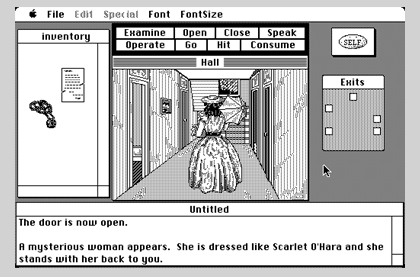 However, I did always have computer games, usually ones made only for Macintosh. Then, later, some of the IBM games came out for Macintosh, so I'd get those eventually. Cap'N Magneto - A space man, Captain Magneto, has crash landed on the planet Rigel IV, and he needs to rebuild his ship and wrest the Crown of Control (some sort of mind-controlling device) from the Menturg, an intergalactic criminal, then escape the planet. Silly game, but boy was it fun. It even had annoying/endearing "commercials," asking you to donate money to the company who made it. Dark Castle / Beyond Dark Castle - Still my favorite games of all time, even in black and white, and they do hold up to the test of time. In both games, Prince Duncan must work his way through the castle to challenge the Black Knight. Déjà Vu (1985) - A "point and click" MacVenture game, wherein the game character is a hard-boiled former boxer turned private eye named Ace who's been framed for murder and needs to clear his name before getting caught by the police or the framers. And he—you—have amnesia, so you've to put your own story together at the same time. Very original stuff. 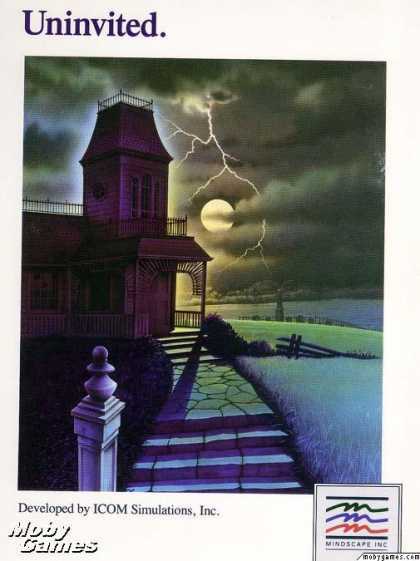 Uninvited (1986) - Another "point and click" MacVenture game, wherein the game character is a guy who has to make his way through a haunted house to find his missing kid brother. Such a creepy vibe. I never did beat this game, but it's been very memorable. I think it helped get me into suspense/horror as a genre. 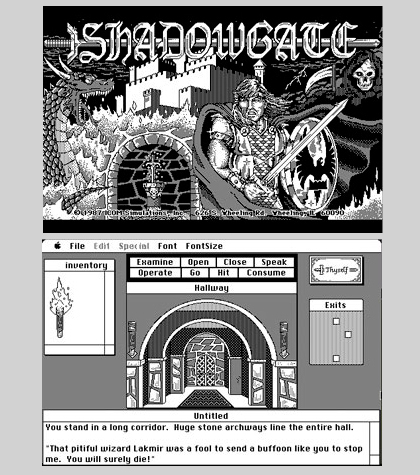 Shadowgate (1987) - Another "point and click" MacVenture game, wherein the game character is the "last of a great line of hero-kings" who must find and defeat the evil Warlock. Goblins, trolls, gargoyles, wraiths, sphinxes...this game had it all. And such a cool cover! Citadel (1987) - Another D&D-style dungeon adventure game. Difficult to win, but very unique interface and inspiring storyline. Déjà Vu II (1988) - Another "point and click" MacVenture game, wherein Ace has ended up in Las Vegas, where a mobster named Tony Malone is scapegoating him, requiring Ace to come up with a hundred grand...or else. No amnesia this time, but flashbacks do recount some past events. Quarterstaff (1988) - Very D&D-esque "point and click" game but with more complexity than those listed above. This one involved hit points and something more akin to a character sheet. In this game, you start off as Titus, a former blacksmith sent by the Druid Council to explore some tunnels from which a subterranean colony once vanished. Along the way you can convince other characters to join the party (notably Bruno, a barbarian type, and Eolene, an archer gal). Cool sound effects, and also very, very hard. Never did win. But the dungeon did have a gelatinous cube, and that was cool. And there was even a part where a poor decision turns you into a grue. The game came with a poster, a parchmenty-like map, and a wooden coin. 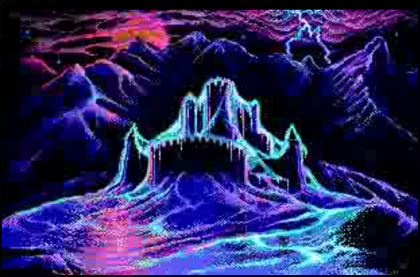 Dungeon of Doom - I think this was one free software (freeware), and I can't recall how I got it. Basically, it was a cartoony dungeon crawl adventure game, wherein you could play a knight (good with armor), a fighter (good with weapons), a sage (good with scrolls), a wizard (good with wands), an alchemist (good with potions), a jeweler (good with rings), or....some guy named Jones. The Pool of Radiance "Gold Box" Series (1988-1993) - Officially Advanced Dungeons & Dragons game produced by SSI and licensed for the Forgotten Realms. I actually didn't own Pool of Radiance, the first installment of the series. I never actually had Pool of Radiance, but I played the rest of them in this series and loved all of them. You built your own party, tailored how they looked, and set off on the quest at hand. Describing these games would be an enormous post in itself, probably not something I'm up to. But they were really influential on me and, I know, to a lot of other people out there. 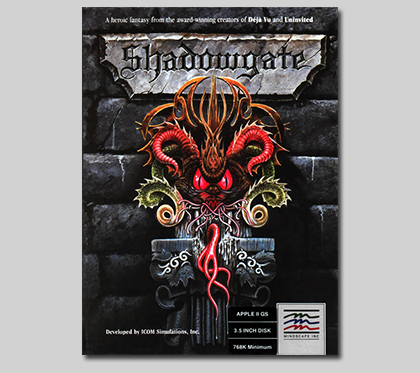 They paved the way for other roleplaying computer games to come; they are to current MMOs (Everquest, World of Warcraft, etc.) what Gary Gygax is to pen-and-paper Dungeons & Dragons. Anyway, I recently came across a podcast called the Online Gamers Anthology. Most of it relates to MMOs, which I'm not a particularly big fan of (with the exception of Lord of the Rings Online), but three episodes in particular stand out, and if you've got some idle time, I recommend you listen to them. I've heard a few podcasts, but the quality of these—and the enthusiasm of its host—beats out many of them. 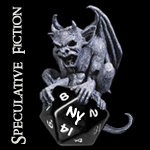 Episode 14 - A look back at D&D (part 1) and an excellent interview with Tracy Hickman. Episode 15 - A look back at D&D (part 2). Episode 16 - Discussion of the Gold Box games; namely, Pool of Radiance. † 'fortuitous - This word means "happening or produced by chance." Which few people seem to realize; most use it incorrectly to mean "lucky," which is a shame, because it's a neat word with a unique meaning. This lazy assumption, that the word is merely a synonym for "fortunate," has actually resulted in its becoming an alternate definition in the dictionary. Well, I suppose that's how a language evolves, but that doesn't mean I always have to like it. 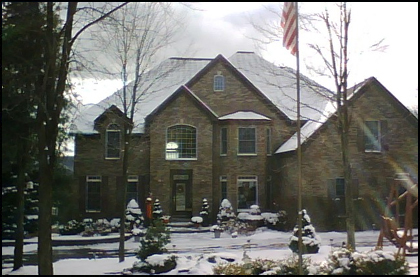 My mom just sent me this photo of my parents' house right now, in upstate New York. Snow = awesome. Of course, many U.S. states already have a great deal of it, and it's not always a boon to them. We are at the crossroads between autumn and winter. It's getting colder, and around the New York City area the trees are almost bare, and the summer folk are complaining even louder. I love this time of year, and I wish it wasn't as busy as it is. But it certainly is. I hope to have more to offer in days to come. Halloween has come and gone. But as the cultural door swings shut on all things ghoulish, why not have one at least one final dose in the spirit of the haunting season? If you're game, check out my review of Boo Berry® cereal. Yes, people, I actually put some cereal on my scanner, cut up a box, and reviewed a cereal that turns milk blue. Am I trying to recapture my childhood? No, because I never had stuff like that growing up; so there isn't a hint of nostalgia there. Although my adult self fully appreciates the notion of a horror-themed cereal and I've certainly always heard of these cereals. The holiday itself was pretty good, although the actual trick-or-treat festivities were minimal in my part of NYC. Still, that didn't stop Marisa and I from dressing up, carving pumpkins, and doing our thing. 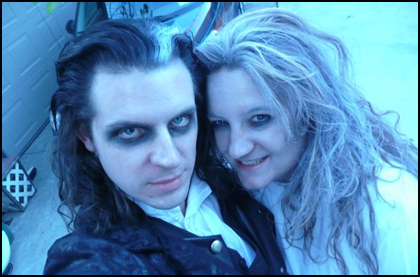 Over the weekend we celebrated our anniversary by going upstate NY to the Headless Horseman Hayrides, which was actually the most elaborate hayride-and-haunted-house locale I've ever seen. 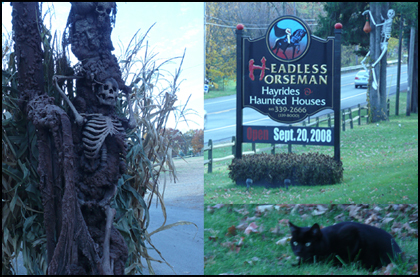 A big cornfield hayride, with an actual headless horseman, a twisted fairy tales theme, and a great deal of theatrical gore. Fun. But afterwards when we went to a semi-fancy restaurant, being fun house snobs, we talked about how it could all have been better. 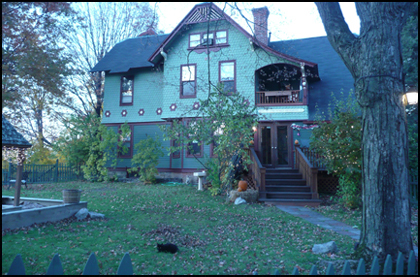 Then we stayed in a creepy bed and breakfast which seemed to fit the season. In other news.... 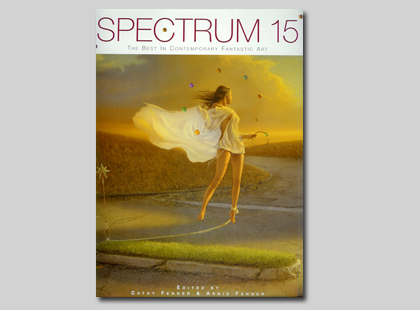 Most of you probably haven't heard of it, but I picked up this year's volume of Spectrum, which just came out. Spectrum is an annual book of the "best in contemporary fantasy art." 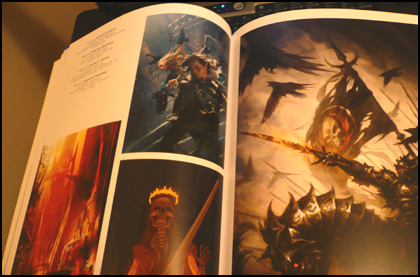 Really, Michael Komarck's painting for The Darkwood Mask ought to be over on that other page, big sized. So what does November hold? A lot of work at the day job, some behind-the-scenes (for now) writing gigs, and some famililal surgeries coming up. Oh, and hey, Election Day is today, isn't it? I already voted, and that's all I'm going to say about that here. People can maybe start getting back to normal, and this country can hopefully begin to find itself again.